Determined to combating food waste, Bottura’s “Refetto-Rio” soup kitchen uses surplus food from the Olympic village in Rio de Janeiro during the Olympic Games, refashioning leftovers into meals for needy diners; Refetto-Rio will provide “19,000 meals for the poor using 12 tons of excess food from the Olympic Village for 5 thousand Brazilians living in a state of social vulnerability. It’s a cultural project, not charity, for the fight against the waste of food: if we change the way we think, we can create a new tradition, Massimo Bottura told to the reporters in Rio. And if a meal at the Bottura’s Michelin-starred Osteria Francescana in Modena has ranked among the world’s top five restaurants since 2010 it can cost up to 600 Euros, eat at the RefettoRio in the bohemian neighborhood of Lapa, in the heart of Rio, it will cost not even a penny. Bottura, founder of the Food for Soul NGO to fight food waste and malnutrition, conceived the Rio with Brazilian non-profit organization Gastromotiva, and the Brazilian chef David Hertz, founder of Gastromitiva NGOs, and journalist Alexandra Forbes: their goal is to fight the junk food, food waste and social exclusion. 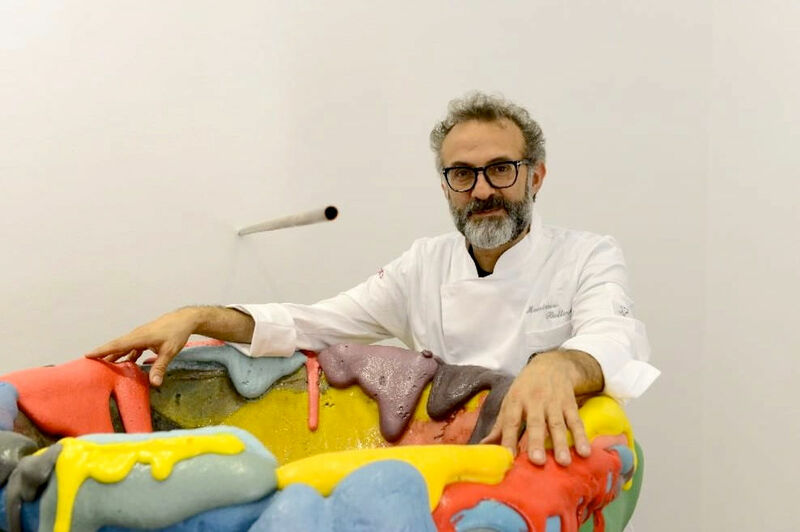 “I promised my mother that I would use my fame to make the invisible visible: and now it’s time to give back to the world what they gave me,” explained Massimo Bottura. The restaurant was decorated by Brazilian artist Vik Muniz with furniture designed by the Campana brothers, the Brazilian design masters. During the Olympics Games, many famous chefs will give a hand to Bottura in the kitchen at the RefettoRio: the French Alain Ducasse and Claude Troisgros, the Spaniard Andoni Aduriz, the Brazilian Alex Atala, Felipe Bronze, Roberta Sudbrack and Rafa Costa e Silva, among others. After the Olympics Games and Paralympic Games the RefettoRio will work as a cooking school open to the public at lunchtime, according to module ‘pay for lunch and you offer dinner to someone who needs it. The project, created on the basis of the Refectory Ambrosiano that Massimo Bottura has created last year and animated throughout the Expo 2015 will be followed by similar initiatives in 2017 in Los Angeles, New York and Montreal, always under the inspiration of Italian chef.